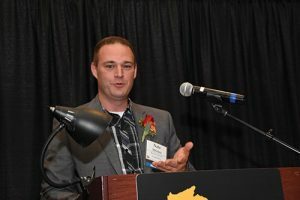 One new director was seated on the Wisconsin Electric Cooperative Association board at the organization’s 81st annual meeting last month. David Hischke, chairman of the Oconto Electric board of directors, succeeds Elaine Eckendorf of Central Wisconsin Electric, who reached her term limit. Hischke was elected during district meetings this past summer. 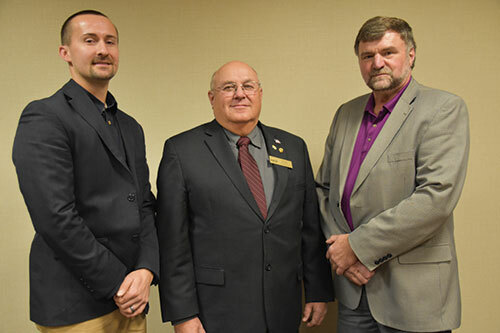 Board reorganization saw incumbents David Paudler of Riverland Energy (center) and Larry Dokkestul of Pierce Pepin Cooperative Services (right) re-elected chairman and vice chairman, respectively. Derrick Oberle of St. Croix Electric (left) emerged from a field of four nominees to succeed Eckendorf as secretary-treasurer. From a field of five nominees for two executive committee slots, incumbent Diane Zimmerman of East Central Energy won re-election and Barron Electric’s Dallas Sloan was the pick to succeed Bill Fischer of Rock Energy. Shannon Clark, Richland Electric Cooperative’s CEO and general manager since 1999, received the Wisconsin Electric Cooperative Association’s highest honor at the organization’s November annual meeting in Stevens Point. Clark is the newest recipient of the ACE (Ally of Cooperative Electrification) Award, given for the past 50 years to a nominee judged to have made distinguished contributions in a manner beyond routine performance of duty, to advance the electric co-op mission of providing affordable, reliable energy to rural Wisconsin. Clark joined Richland Electric in 1991, still in his 20s, as manager of administrative and member services. 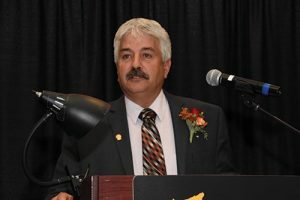 He has been a longtime leader of efforts to expand telecommunications and data services to rural Wisconsin and has served on numerous local, state, and national co-op boards. This summer, he received a regional service award from the National Rural Electric Cooperative Association, recognizing his successes promoting rural economic development. Mary Kay Brevig, Eau Claire Energy Cooperative’s communications and public relations manager, was presented with the N.F. Leifer Memorial Journalism Award last month at the Wisconsin Electric Cooperative Association’s annual meeting. 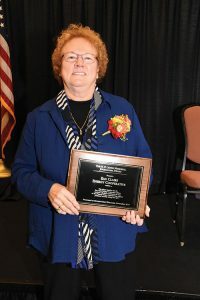 Named for a former Vernon Electric Cooperative manager who played a key role in creating what became the Wisconsin Energy Cooperative News, the award is given annually to the cooperative selected by an independent judge as having created the magazine’s best local co-op pages during the prior year. All local-page content is produced by employees at WECA-member cooperatives, and Brevig is responsible for Eau Claire Energy’s pages. She has won the award on three past occasions. Leifer was a founder of the Wisconsin R.E.C. News in 1940. Originally a tabloid newspaper, it was the nation’s first statewide periodical produced for the general membership of rural electric cooperatives. Nathan Steines, director of operations at Barron Electric Cooperative, is the 2017 winner of the Herman C. Potthast Award, given annually by the Wisconsin Electric Cooperative Association to honor outstanding performance in electric utility job training and safety. Steines was honored for actions in his previous position as a lineman, when he came upon a highway accident, contacted emergency personnel, assisted the victims in escaping their overturned vehicle which was leaking fuel, and attended to them until medics arrived. The Potthast Award’s namesake served Wisconsin’s electric cooperatives for 29 years. He chaired the National Safety Council’s utility section and, for more than two decades beginning in the early 1940s, spearheaded development of safety standards and practices for electric utility workers nationwide. Two Wisconsin electric cooperatives will share in some $2.5 billion in U.S. Department of Agriculture rural development loans announced in November. Vernon Electric and Chippewa Valley Electric are to receive $23 million and $7 million respectively, to help finance line improvements and smart grid projects in their service areas.